At its core, a hearing aid is a microphone, an amplifier, and an earphone. Each element is critical to the quality of the sound produced by the device. For the Tympan, it (currently) is simply the amplifier (ie, the electronics) -- you have to bring your own microphones and speakers. In my last post, I looked at a few different microphones. Today, I'm going to look at some earphones. I'm going to calibrate a set of earphones with the Tympan to measure the frequency response and overall loudness. 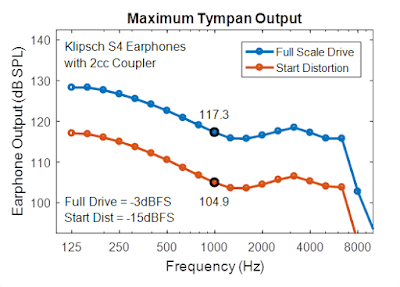 Earphones: The earphones that I'm going to calibrate are my Klipsch S4 earbuds. They are absolutely nothing special. They are simply low-cost, consumer-level earbuds like anyone might have. I think that inexpensive earbuds are where a lot of people will start when using the Tympan, so it's where I'm going to start with my earphone calibration. Setup: My overall setup is shown in the figure above. I'm using the the Tympan electronics to drive the earbuds. The Tympan has been programmed to generate a tone that sweeps from low frequency to high frequency . The earbuds are fixed in a coupler, which mates to a laboratory-grade microphone (B&K 4192) and data acquisition system. So, by generating tones at known digital level in the Tympan, I can measure the corresponding sound pressure level produced by the earbuds in the 2cc coupler. Coupler: The coupler is a very important part of this setup. Earbuds are supposed to be worn in an ear canal. There is very little volume in your ear canal that the earbud needs to drive. So, if you want to measure the response of an earbud, you need to use a coupler that creates a similar small-volume environment. Which Coupler to Use? There are two typical choices for couplers for this kind of testing: (1) an ANSI-standard 2cc coupler, or (2) a so-called "artificial ear". While the artificial ear is designed to give a more realistic response, a basic 2cc coupler is what the ANSI standard uses for hearing aid assessment, so that's what I'm starting with. My 2cc coupler is a B&K Type 4946, shown above. Fitting my earbud to the coupler's adapter. The output of the earbud should be flush with the hole in the adapter plate. Fitting the Earbud: The 4949 includes different adapter pieces to help fit a variety of hearing aid styles. 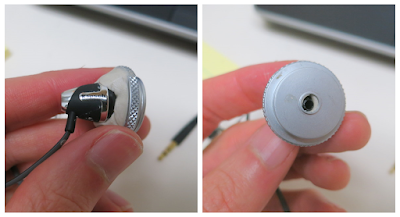 For my earbud, I chose to use the broad dish-shaped adapter piece intended for in-the-ear hearing aids. As you can see above, I used putty to hold the earbud in place and positioned the earbud such that the output of the earbud is flush with the opening of the adapter. It isn't pretty, but I think that it gets the job done. Completing the Setup: Once the earbud and adapter plate were fit to one end of the coupler, I inserted the measurement microphone into the other end of the coupler. 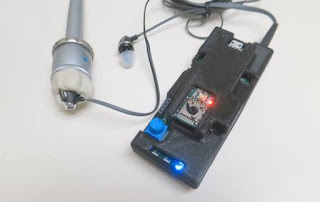 I connected the earbuds to the Tympan electronics and programmed the electronics to produce frequency sweeps at different digital levels (my code is on my GitHub here). My setup used to calibrate the Tympan output with my Klipsch consumer-level earbuds. Raw Data: Some raw data from this measurement is shown below (raw data is in my GitHub here). It is the measured sound output from the earpbud as measured by the microphone in the 2cc coupler. This microphone is calibrated to units of Pascals from which sound pressure level (SPL) is easily computed. 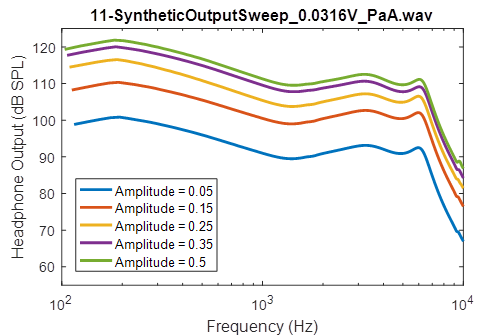 As you can see, I had the Tympan generate five frequency sweeps, each one at a louder amplitude. Raw data recorded from the Klipsch earbuds during this calibration testing. Actual Amplitude: In my Arduino code, I thought that I was commanding the amplitude to step from 0.1 up to 1.0. In later analysis, however, I discovered that the ToneSweep object from the Teensy Audio library only produces half the amplitude that you think. So, when you command "1.0", you actually get an amplitude of 0.5. I confirmed through by sending the audio out the USB Audio connection to the PC. It was half. So, instead of spanning 0.1 to 1.0, my test spanned only 0.05 to 0.5. 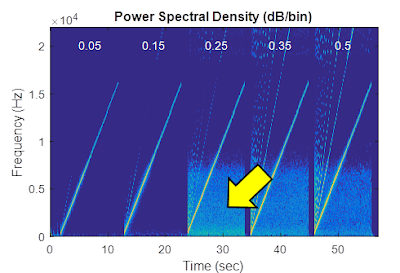 Low-Level Noise: When I looked at this raw data in the frequency domain (see spectrogram below), I was surprised to see this strange, low-level background noise appear at the higher drive levels. It first appears at a digital drive level of 0.25. What is this? At lower drive levels it is not there -- it just magically appears at 0.25. This is very strange. Spectrogram of audio produced by the Tympan via the Klipsch earbuds during the calibration tests. When the drive amplitude is 0.25 and above, a low-level background noise appears. Data Analysis: From this raw data, I divided the recording to isolate each frequency sweep. 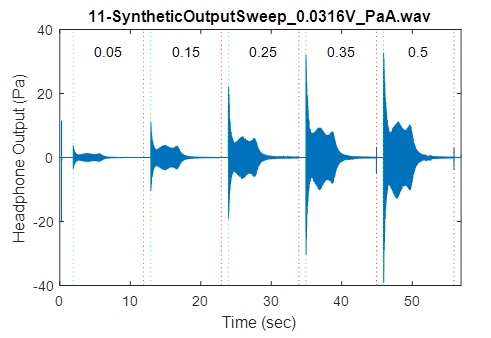 Then I measured the SPL at each frequency (analysis code here, more Matlab functions here). 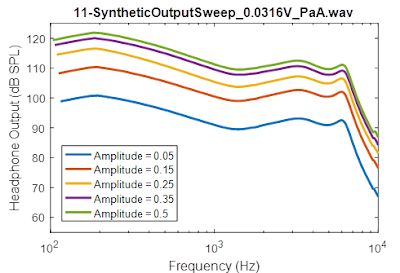 For each drive amplitude, the measured response is shown in the figure below. As expected, the frequency response is basically independent of amplitude, which is good. 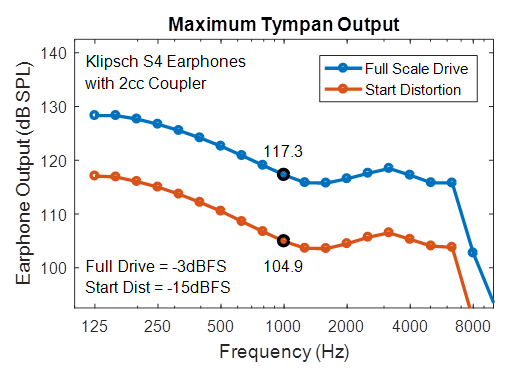 Measured frequency response for different drive levels. The Bottom Line: The figure below is how I chose to summarize these results. The red line is the measured frequency response and loudness when driving at an amplitude of 0.25, which is when that low-level noise/distortion appears. The blue line is the frequency response that I measured at my strongest drive level (0.5 relative to full scale) that I then scaled up as if I had driven it at the hardware's maximum drive level (1.0 relative to digital full scale). As can be seen, at 1 kHz, the system should be able to produce about 117 dB SPL at full drive. Bass Boost: A secondary result that is obvious in this graph is that these earphones do not have a flat frequency response. Not at all. These consumer-level earphones clearly provide a strong boost to the frequencies below, say, 500 Hz. I'm guessing that this bass boost this was a conscious decision by the designers in order to appeal to a certain segment of the earbud market. This is perhaps not the ideal response for a hearing instrument. I'm curious to test other earphones to see which earbuds might have a more flat response. Caveat: An important caveat to this work is that the measurements were taken using a 2cc coupler. Your ear is NOT the same as the 2cc coupler. In a real ear, the frequency response could be quite different. Perhaps the overal SPL produced by the earphones will be higher (or lower). These are important questions. So, in the future, I'd like to repeat these tests using an artificial ear, which should better simulate a real ear. Will the results be different than on the 2cc coupler? I look forward to finding out!